The gospel had been a topic for discussion in Zürich since 1522, not only for theologians, but for people of all social classes and the beginning of the reformation may be seen as part of a greater mass movement, rather then the product of Ulrich Zwingli alone. Key protagonists were radical evangelical preachers, a committed evangelical minority in the rural communities and radicals in the city, in particular the later anabaptists who forced the Zurich council to initiate reform in the church, using, among other strategies, iconoclasm. 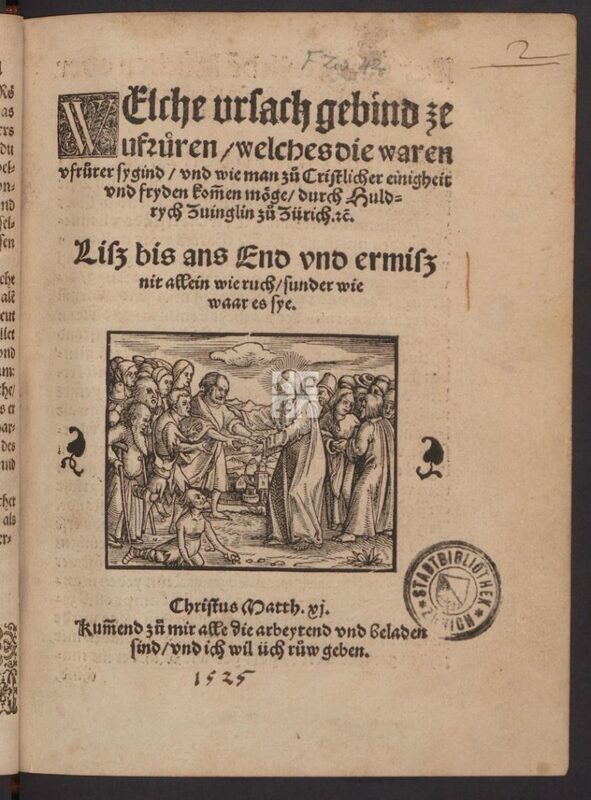 This pamphlet by Zwingli reflects the situation at the beginning of the peasants‘ war and on the eve of anabaptism, demonstrating the reformer’s efforts to avert the imminent division within the reformation movement. To this end, Zwingli attempts to unmask the true insurgents, not as the later anabaptists, nor as the roaring peasants, but predominantly as the corrupt clergy. Self-interested and unjust adherents among the evangelicals are equally subjected to his critique. The title-page of the pamphlet, printed in January 1525 by Christoph Froschauer, is adorned with a woodcut in the manner of Hans Holbein, illustrating Zwingli’s motto (Matthew, 11:28) of how the burdened come to Jesus. Our gaze is directed to the middle distance behind the two groups of people, where the temple of Jerusalem symbolizes the presence of God. To see the digitized print click here.